When Marcus Ampe received (a few weeks ago) some e-mails from worried brethren living in Israel, fearing attacks from evangelist preachers he on the request of his brethren and in Jesus interested Jews, took away the mentioned articles on his blog “Our World“. Though nothing should have worried sincere people, because in the article was mentioned the good work done by and between Israelis and Palestinians who wanted to opt for peace and a way of living together. Certain Zionist groups with fundamental christians oppose such a world were Jews, Muslims and Christians would live together in peace. In Israel, the Netherlands, as well as in the United States of America we can hear lots of voices who shout for the return of the Jews to Israel, but this at the cost of other people. What people should notice by such preachers and by the mega churches which seem to pull more and more people to their church, is what those preachers say in their sermon often goes far away from the Biblical text. also here in Belgium we can find on several tv-channels, mostly from the Netherlands, several preachers who are very capable to speak with fire and with drama. We can not resist to think they are very good performers. But God does not require a priest, pastor or minister to be an actor. Everything what is said about God and His commandments should come out of the heart. We can not ignore that the last few decades we have seen coming up many more preachers we would consider to be false preachers and even false prophets. False prophets are becoming more prominent in today’s age of tolerance and rebellion against God. Not many people are interested in God, and the majority who feel something for a god or God love to see a god who fits most their idea of a god or does the best for them. In our days we find the majority of people who want to be religious, looking for an easy religion. They prefer that the religion fits their way of life and would not require to much effort and would offer no consequences. This generation more than any other wants to live however they’d like, without boundaries or authority. Unfortunately, there are plenty of teachers and preachers eager to give the people what they want to hear. In this world full of adulterers we can say it is like in the ancient times at certain moments, when there was the force of man which was not right. In the past, even God could find profane priests their wickedness. Also in the Messianic writings people are warned for the time that would come when people will not endure sound teaching, but would prefer to hear that what they would love to hear and what sounds good in their ears, suiting their own passions. For many the Truth is something very hard to grasp or is something what takes away all their lovely myths and breaks with all their heathen traditions. that is why so many churches, like the Roman Catholic Church, always have adapted their rites to the common traditions of the regions where they tried to convert people to their faith. The Roman Catholic Church is one of the religious groups which succeeded most successfully to adapt their teachings to the wants of the people and providing them enough power to have everyone in their hold. This culture is eager for an easy religion – one that requires no effort and offers no consequences.For them several protestant groups do have a solution. In the protestant churches of today there are plenty of teachers and preachers eager to give the people what they want to hear — and usually, they end up making a large sum of money off it. In the last book of the bible (the most difficult one to fully understand), is given a picture of the dangerous evil coming into the time closer to the end of everything. We are told that at the time of the end the evil or the rebellious figure against God (satan) shall become stronger. From that book of revelation, we can learn that in a certain way it shall be those who are against God (the satans) shall have dominion over the earth, and a religious personality will arise and deceive the whole world by means of miraculous signs. This individual is referred to as “another beast” (Revelation 13:11), as well as “the false prophet” (Revelation 16:13; 19:20; 20:10). For some people it may be strange to hear a person could sound like a dragon when he speaks, but that is what we do hear when those fiery preachers raise their voices and try to draw everyone into their story. Their mouths are like the mouths of a Dragon, the Beast, and the False Prophet the apostle John could see. From the very beginning the entire world and its cultures came in disobedience to God because of the influence of their own false thinking (evil way of thinking or being the satan). We should know that the world is in deadly antagonism against God, against the way of God, and the people of God because the spirit generated by the unseen prince of this world. It is essential that we stay awake and keep our guard up. Certainly coming closer to the end-times, a time were those who oppose God shall be in the majority, and seemingly stronger. Though we may not be mistaken. The true lovers of God shall recognise their seductive tricks and by keeping to the Biblical Truth shall find enough strength to resist their tempting talk. Even at times that those false preachers or false prophets will wield tremendous religious influence, and will successfully convince most of the world to commit idolatry (Revelation 13:12). Those false preachers shall manage to get enough people to worship the wrong god, also partly because partly people prefer to keep to human doctrines and partly because those preacher can come up with bigger churches and as such seem to be more credible. The course of this world is combined with the “prince of the power of the air”, and these people who are caught by the attractive words of those false teachers, are seen as being disobedient to God’s Word, though often they think they know some verses and use them as the truth. And so it is gradually, slowly but surely, as we narrow it down, beginning to indicate more and more an evil system that is opposed to God. It is in this sense that it is used in those very famous scriptures there in I John 2:15-17. Those who love God should be joining hands with others who also do not love the world’s ways. They know that love of the world squeezes out love for the Father and that is what we can see all over the world happening. At many places we also see preachers who strongly want to convince people that the Father and the son would be one and the same, so that their followers would worship an other god than the God of Jesus Christ and his pupils, who worshipped the God of Abraham, the God of Israel Who is Only One True God. Practically everything that goes on in the world, what we can see, is that most people are wanting it their own way, wanting everything for themself, wanting to appear important. This way we can see that several evangelist teachers are able to isolate people from God the Father and minimise the acts of Jesus, because they tell people no man would ever be able to do such thing as Christ did. Too many people do forget that God spoke several times to the world by way of true prophets, who told there was going to come a sent one from God, a saviour out of the seed of David (so still had to be born or had to come into existence when they wrote down the Words from God). From the ancient Scriptures we can read there has also been a time that there were shepherds who deceived the flock of Israel and that God His wrath came upon them and the anger of God was not to return until He has executed the thoughts of His heart. We should take that text from the Old Testament serious. It is also something we should remember in these days. Today we can see many preachers who claim to be workers for God, though present to the people another god than the God of the Bible, the One God of Moses, Who is the God of gods. The God of the Scriptures, Israel’s God, also speaks to those so called ‘shepherd-leaders’ who misled and still mislead His creatures. They should know that God not only keeps an eye on His people, but He is keeping His eye also on those who so called speak in His Name. We are told and they are warned, that God keeps track of their criminal behaviour. For true lovers of God there is the hope and assurance that God shall take over and gather what’s left of His sheep, gather them in from all the lands where God has driven them and He shall bring them back where they belong, and they shall recover and flourish. The world shall have to come to see that how closer we come to the end times, how more the world shall come to hear real lovers of God telling about the Biblical Truth and the coming Kingdom of God. Though there may be a growing number of false prophets, the Most High Elohim, Jehovah God, shall provide shepherd-leaders to protect His flock and to take good care of them. The world may do a lot for making them afraid, but those who are against such witnesses for Jehovah should know that they won’t live in fear or panic any-more. So the world has to watch for this. The time’s coming “GOD’s Decree”. and people shall come to see that God really did not sent those coaxers and prophets of deceit. How fearful it must be to fall in the hands of an angry God and this is what is happening, if God is against you, no one on earth and heaven can save you! therefore we should give heed. We should be very careful that we come to know the Biblical truth and are not carried away by the many false teachings and doctrines this world presents to us, and may look very attractive. God will bring will bring upon those false teachers and their followers everlasting disgrace – everlasting shame that will not be forgotten. We must know that they even shall not be there to go in the promised Land when the Kingdom shall be restored. We must open our eyes and see what is going on in this world and how false prophets are becoming more agitated when they hear biblical truth around them. It even brings them so far they want to attack people (like we could see and feel in Israel). What we encounter most in these days is that people do not want to take time to see what is really written in the Bible. There is the big need to study and to listen to the Words of God. we must observe the scripture and know the content, so we can discern about these things, that we can spot false teachings. That we must repent from our own ways. At nightfall tonight, we spend the entire first night of Shavuot studying Torah. The traditional Tikkun Leil Shavout (“Rectification for Shavuot Night”) study program includes the opening and closing verses of each book of the Written Torah (Tanach), as well as of each Parshah; the entire Book of Ruth; the opening and closing sections of each tractate of the Talmud; a list of the 613 mitzvot; and selected readings from the Zohar and other Kabbalistic works. Remembering that on the 6th Sivan of the year 2448 from creation (1313 BCE), seven weeks after the Exodus, mankind was blessed by the Elohim revealing Himself on Mount Sinai and wanting to give the Words of Guidance. The entire people of Israel (600,000 heads of households and their families), as well as the souls of all future generations of Jews, heard God declare the first two of the Ten Commandments and witnessed God’s communication of the other eight through Moses. Following the revelation, Moses ascended the mountain for 40 days, to receive the remainder of the Torah from God. Now although we know that the Torah was given on the 6th of Sivan, during the time when the calendar was fixed by eyewitnesses to the new moon, the fiftieth day — Shavuot — could fall on the 5th, 6th, or 7th of Sivan. Therefore I would love to mention this today and call to you for remembering the set apart moment of the elohim coming closer to His People, giving them something precious to hold on, so that they could be sure to please their Most High Maker. Nonetheless, now that the calendar is no longer variable, Shavuot always coincides with the 6th. And there is also a Biblical allusion to the significance of Shavuot in the fact that unlike the other festivals, the word “sin” is not mentioned in connection with the special sacrifices for Shavuot, and this is related to the Israelites’ acceptance of the Torah, which gave them the special merit of being forgiven their sins. Within the diversity of the world we as lovers of God do have to come in unity with the divine Maker. When we look at the world around us, there are enough things which reveal the Master Hand of the Divine Creator. This should give us confidence that the Most High is always active, omnipresent and that it is on Him we should rely. In the month of Nisan we remembered how God’s People “fled” from Egypt, both literally and metaphorically — fled from the knowledge of the world and were filled only with the revelation from above. Their unity was of the world-denying kind. The elohim for them was One because they knew only one thing, because the world had ceased to have being in their eyes. Iyar, the second month, is the month wholly taken up with the Counting of the Omer, and preparing ourselves for the coming events at Sinai. The divine Creator wants each of us to be aware of ourselves and likes to see that we can have our world as something apart from God which has to be suppressed. Now in the third month, Sivan, we look up at the time when the Torah was given, when God and the world became one thing. We must look at ourselves and recognise that we are still far off from being really totally “one with God”. We are not yet at one with the Eternal Most High Elohim Hashem Jehovah. Many still even do not dare to come close to Him pronouncing His titles or to enunciate His Divine Name. We should be aware that first of all there has to be a willingness to come close to God. The best way to do that is by studying the Word God Himself has delivered to mankind. Today nobody really has an excuse that he or she would not have been able to hear God’s Word. Nearly everywhere in the world the Word of God is available in oral form, printed form with Bible translations in lots of languages so that people always could find one or an other language they can read and understand. The ultimate unity with the Most High comes only through (learning) Torah, when the mind of man and the will of God interfuse. Is there any evidence that John, the disciple of Jesus, was black? This lesson is part of Mel Lawrenz’ “How to Study the Bible” series. Let’s imagine ourselves as believers in first century Thessalonica, Greece, the day that a letter was received by the leaders of the church — a letter from the founder of the church, the apostle Paul. You are one of the elders of the church, and you read Paul’s instruction and admonitions with a sense of urgency and care. There is no “New Testament” as the 27 books we know today. The Gospels have not been written yet. Not Romans or Hebrews or Revelation. You and the rest of the leaders in Thessalonica are going on the gradually unfolding apostolic teaching which formed the foundation of the early church (Ephesians 2:20). You listen carefully to the words, read out loud by one of the other leaders. And then an important process unfolds. You and the other leaders of the church discuss what you have just heard from Paul. You go over what he has written about suffering, and sanctification, and salvation. You ask for someone to re-read the bit about the coming of Christ. Someone suggests the entire letter be re-read again, from the beginning. You discuss Paul’s points. Sometimes there is a little disagreement over something specific Paul said. You talk about why he wanted this church, the believers in Thessalonica, to understand these specific things. You discuss how to apply the meaning of Paul’s words. One leader suggests an application, and someone else enthusiastically suggests another application. After a couple of hours of discussion you realize that this short letter, this authoritative word from God’s chosen apostle, is going to reverberate in your community for a long time to come. Paul has addressed some controversies, reinforced some teachings, and pioneered new ideas. You come to understand this letter to the Christian community in your city of Thessalonica because you have read it together, discussed it together, and applied it together. So here we are in the 21st century reading the same words, attempting to get the meaning and apply it responsibly and fully. We do so, not in isolation, but with other believers. We get the gold from the goldmine of Scripture not by prospecting in isolation, but as we work together. Bible study is a community effort. For some people, that impulse comes naturally. They don’t want to be isolated, and they read Scripture and immediately want to compare reactions and interpretations with other people. Some people, however, so value that holy time when they privately read and explore Scripture, asking the Holy Spirit for illumination, enthused with new discoveries, slain by confrontation, inspired with new visions of God, that they almost want to avoid discussing the Bible with other people. They may believe that private interpretations of Scripture are sacrosanct, and that comparing notes with others takes something away from their genuine interaction with God. We need to be balanced here. It is true that the truth of God in Scripture is available and accessible to any individual believer. No one stands between us and God. But on the other hand, we are in this together. God gives different insights to different people—not splitting the meaning of his word, but revealing different facets of it. That’s the way Scripture functioned in ancient times, and it is the way we should study it today. So what does that look like today? 1. We should all find fine Bible teachers and benefit from their instruction. That will include local pastors, but also the radio and the internet. We have a huge advantage today in being able to subscribe to podcasts or log into sermons preached thousands of miles away. It is better to listen to multiple teachers rather than just one. We are disciples of only one figure — Jesus the Christ — not the pastor with the largest podcast. 2. We should read widely, but with discernment. You can google any Bible question you have and get hundreds of links, but much of what Google leads you to is junk. Know the writers you follow— their organizations, their publishers, their associations. 3. We should view our use of commentaries and other tools produced by reliable scholars as a function of the wider Christian community. 4. We should study Scripture with other believers in our communities. It is exciting to sit in a circle and work through Bible study when it is led by someone who understands Scripture and proper methods of interpretation. It is powerful when members of the group contribute their observations, ask their questions, explore their thoughts about application. It is important for the leader to be well prepared, and present enough for a rational discussion to take place, and then to guide the group, drawing people out. 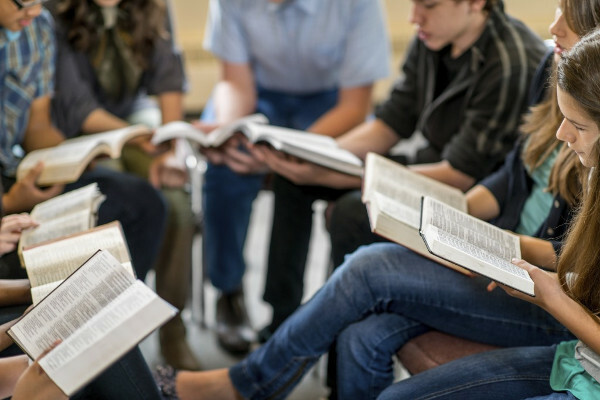 Group Bible study should not be passive listening, and it should not be a pooling of ignorance. Group Bible study works best when it unfolds over a long period of time. We are in this together, just like the early communities of believers were. The beauty of it is that we get to know God better as we get to know each other better. The truth of Scripture is a living, dynamic force in our lives. On our best days we see that power in us — and we see it in each other. Mel Lawrenz trains an international network of Christian leaders, ministry pioneers, and thought-leaders. He served as senior pastor of Elmbrook Church in Brookfield, Wisconsin, for ten years and now serves as Elmbrook’s minister at large. He has a Ph.D. in the history of Christian thought and is on the adjunct faculty of Trinity International University. Mel is the author of 18 books, the latest, How to Understand the Bible—A Simple Guide and Spiritual Influence: the Hidden Power Behind Leadership (Zondervan, 2012). See more of Mel’s writing at WordWay. Today there is still lots of commotion about works and faith. Still too many Christians do think they do not need any works. The Catholic church, we must say, has from the beginning seen that certain works were necessary. One can not become a Christian without putting the previous life of sin away by having regret, asking for forgiveness of sins and taking steps to show regret (an act to be taken), opening oneself for remission by going for a baptism (a work). Not only Rome sees baptism as a channel of sanctifying grace, as the primary instrumental cause of justification, and the sacrament of penance, whereby congruous merit is achieved through works of satisfaction, as the supplementary restorative cause whenever the grace of God’s initial acceptance is lost through mortal sin. Not only for the Roman Catholics believers save themselves with the help of the grace that flows from Christ through the church’s sacramental system. Several other denominations request that people change their life once baptised (which sometimes demands lots of works). Other protestants groups do forget that it is impossible that a Christian would keep living the same sinful life as before his or her baptism. It is an illusion to believe that we are saved by the blood of Christ and would not have to do any works any more because we would go to heaven or always will be allowed to enter God’s Kingdom. First of all the Kingdom will be here on earth for most of us. And Jesus showed us with his parables the danger of loosing the entrance through the small gate of life in eternity. Justification may be given free, like people can win a lottery, but if they do not do anything with the price, they will be nothing with it. For example if I would give you a limousine you are nothing with it if you do not use the key and turn the motor on (a work). Before you can go into the traffic you have to learn the road code and have to learn to drive. Then you will have to drive (doing a job) and shall have to be careful in traffic (taking attention), going to some place (trafficking). Also with faith we do need to come into the faith (a work), trafficking, having to keep our faith (demands work), read the Word of God regularly and study it (demands work) we have to be careful to keep the code of God, His regulations and ordinances (keeping to the commandments requires work). Jesus also gave the order to go out in the world to proclaim the Gospel of the coming Kingdom (which demands a work) and to come together regularly, i.e. meeting with each other, which demands also some work. For those who think they do not have to have self-control (which demands work) we must disappoint them. If they keep lying, bullying, stealing, fornicating, murdering, they shall miss the entrance of the coming Kingdom. If they think it will be so easy in this system of things, we also must disappoint them, because also when baptised there shall be temptations, suffering and so on, which demand stamina to continue (work) in the faith. doctrine of justification, storm center of Reformation = major concern of apostle Paul = heart of gospel (Rom. 1:17; 3:21-5:21; Gal. 2:15-5:1) shaping both his message (Acts 13:38-39) + his devotion + spiritual life (2 Cor. 5:13-21; Phil. 3:4-14). > other New Testament writers affirm same doctrine in substance => terms in which Protestants have affirmed + defended it for almost five centuries are drawn primarily from Paul. Justification = judicial act of God pardoning sinners (wicked and ungodly persons, Rom. 4:5; 3:9-24) > accepting them as just => putting permanently right their previously estranged relationship with himself. > => justifying sentence = God’s gift of righteousness (Rom. 5:15-17) = his bestowal of a status of acceptance for Jesus’ sake (2 Cor. 5:21). necessary means, or instrumental cause, of justification is personal faith in Jesus Christ as crucified Savior and risen Lord (Rom. 4:23-25; 10:8-13). As we give ourselves in faith to Jesus, Jesus gives us his gift of righteousness, so that in the very act of “closing with Christ,” as older Reformed teachers put it, we receive divine pardon and acceptance which we could not otherwise have (Gal. 2:15-16; 3:24). Wednesday of Septuagesima week: O, Merciful God! Have Mercy On Me The Fallen One! My Take on the Gay Marriage Bill. We don’t meet God 1/2 way. (12/31/2015) By Faith, Not By Interpretation? The doctrine of justification, the storm center of the Reformation, was a major concern of the apostle Paul. For him it was the heart of the gospel (Rom. 1:17; 3:21-5:21; Gal. 2:15-5:1) shaping both his message (Acts 13:38-39) and his devotion and spiritual life (2 Cor. 5:13-21; Phil. 3:4-14). Though other New Testament writers affirm the same doctrine in substance, the terms in which Protestants have affirmed and defended it for almost five centuries are drawn primarily from Paul. On the tenth of October 2015 in the United Kingdom there took place a debate on the dwindling numbers of community members. “Small” and “big” may be relative, but for certain faith groups in Christendom they can not ignore that they are a tiny group. The groups of Christianity who keep to the teachings of Jesus and who believe what he and his Father say are also “small” compared to the mainline churches of Christendom. The Christadelphians, who are a very small group in Christianity its non-trinitarian groups had all the reason to come together at Dudley college to look at their society. The Christadelphians were once an outspoken, vibrant, edgy “Christian” group who spread their urgent end-times message far and wide. They grew exponentially in the latter half of the nineteenth century, but their heyday is long past. For several decades now they resemble a heavy rusty old steam locomotive that is running out of speed as it lumbers along ill-kept tracks, but still tries to muster the motion needed to take on steep mountain slopes. recognised Arne Roberts who looked at the community of Dr. John Thomas who inspired many Bible Students from which later came such today better know and much bigger groups like the International Bible Students and Jehovah’s Witnesses. Al over the world we may find big churches and in the United States of America we even can find mega churches. What we can see and hear at those churches and institutions that often they have gone far away from the Biblical Truth. Many people may think the big churches and those who have the classical church building are the real good churches. On what do they base themselves for making that judgement? Is it really the looks outside that make the Church of God. are those places with shining gold and many pictures and statues the right temples god wanted to have build for Him? And in those huge places is there done a worship of the right god and in the right way, according to God’s Wishes? Often it is better to be a small church, with people so loving the Word of God that they really spent enough time studying it and living according to it. The only danger with a small church is that with being small there can be a small mindset or that people do not feel enough encouragement and start loosing interest. A small group (12-15 people) is the perfect environment for people to share needs of being able to talk to people, to share ideas, to feel common ground and to find an intimate environment. In fact, this is the size of group Jesus himself also used for discipleship and his disciples also came together in small groups at each-others houses. they did not have especially build worship places outside the synagogue. For their bible study and worship of God those who were not a Jew, but followed the teachings of Jesus, gathered regularly in public and private places. They were not looking for big numbers but were happy to meet with like minded followers of Christ. Let believers always assure that they go hand in hand with each other, looking for the biblical knowledge and wisdom entrusting the elder-ship, leadership or guidance of their church by people who are really founded in the truth, continuing to study that Word of God and putting it in the first place plus knowing where and how to go to. In that small church may be a strong feeling of togetherness where the leader of the group does not as a dictator but is willing to share his vision and hopes that can inspire and affirm what God is stirring in the hearts of that small community. A major problem in the church. With respect to the authority of Scripture, the greatest challenge facing Bible-believing churches today is not the disbelief aimed at the Bible from outside the faith; nor is it the attack against it from unbelieving theologians cloaked with Christian terminology. The greatest challenge facing Christians are pulpits where the inerrant Word is wholeheartedly affirmed but routinely side-stepped and ignored. If your preacher is not preaching the text, he is not preaching the Bible, and functionally denies its authority. It does little for the church to affirm the authority of the Scriptures, if the church’s preachers are not shaped by it. If the preachers and elders of the church are not fed on the Word of God, with what do they feed the sheep entrusted to them? asked Cecil J. duCille (1922-2009) in one of his devotionals. He looked at the human beings who did perhaps good but did not follow that inner voice they had to hear in themselves. In many churches we do find preachers calling for giving money so that blessing can come over you. We can assure you that are not the right ways. Man can not bribe God. There is nothing you can purchase from God, who you can not buy over either. God is not corrupt and you can not corrupt Him. In this world we can see lots of people who have lots of questions and are looking for some answers. Some parents can not follow their children or do not understand why they go certain ways. Often they forget how important their example is in the course of their children. Though we should not think too fast they are unbelievers. Perhaps they are in a stadium of questions and will coming in a later stadium of asking questions. They are aware that “our Earth” is not such a stable and unchanging home as we would like nor a “sure stronghold” which could never be substantially disrupted. As such people shall have to come to ponder. They can not find the real answers in their communication with man and then they may see those people who believe in such an unseen Higher Supreme Being. This can give them a Question to Ponder : Communication with God. In this world of communication we see that lots of communication gets lost in the ‘fog’. Workers and bosses seem drifted away from each others understanding and seem not able to communicate properly any more. They find it strange that there are such silly people who have an Almighty God as their friend. They wonder how that can be. How can people believe in something they can not see nor hear? There, they forget that the Works of that God can be seen every day around us and when man opens his or her ears to the Voice of that God they will hear that God speaking to them. Jesus reveals that God is our Heavenly Father. Whilst we have people looking at their phone, constantly following all the sms pop-ups on that little screen, they forget to use their brain message sending to the More Important Message Receiver and Replier. All those who look for the pagan solutions or think the atheist world can bring the right answers perhaps could also have a look at the other side. In case they would listen to their inner voice they could be surprised to hear other voices, other ideas and can come to discover that there is really something more special, which (true) we can not always or fully understand. But giving time to that inner voice and taking time to come to know what is written in that Book of books we can come to know God as our Heavenly Father – the perfect father that none of us every had. You shall be surprised that you even shall be able to experience greater intimacy with Him than with any other person. In heaven we do have somebody speaking for us. We have a mediator coming up for us. God listens also to this man his intercession. Jesus is that mediator who sits next to God. He defends us and can explain how we really feel and what we really want, though God knows this all, but is willing to listen to that intervention by His only begotten beloved son. When man goes looking for God the Most High Supreme Being is willing to come to man. when we are sincere in our search He will be there to give us answers. We then only have to listen to our inner heart and react accordingly. This means that sometimes, not to say ‘often’, we shall have to make a choice, setting human traditions aside and taking those human teachings as false teachings. We when we hear that Voice of God shall have to make the proper choice to listen to that Higher Voice or to prefer continuing to listen to man’s voices. In the world to day many have drifted far away from the truth. Lots of people do not want to see the relation of what happened in the garden of Eden at the beginning of times and what was promised there. Several people may believe in the promise made over there but still think that one Messiah still has to come. Others do not want to believe the Creator was able to make perfect human being who could follow His commandments and therefore He would have to have come down to the earth to fake his death and to fake that He was taken out of the dead. Scriptures tells us that man nor death can do God anything. That truth is overlooked by many man. They seem to forget that God is a loving God Who keeps His promises and Who says things how they are, not wanting disorder, but order like He created order out of chaos. that was part of His creation and is still part of His Plan. Our hopes should be in that Plan of God which shall come to be fulfilled. The adversary of God is always around trying to confuse people and to bring them on the wrong path, making them worshipping some else than God the Divine Creator of heaven and earth. It is Jesus who invites us to come and sit at his table. Jesus and God are knocking at our doors. Jesus is the Way to God and the Way to the Kingdom of God. With the birth of Jesus the kingdom came near and people had to come to see the messenger of God, who was promised already long ago. Many did not want to see in this miracle-worker the man of God, the prophet who would trample the figurative snake, making an end to its killing snakebite. With Jesus’ death became nailed at the wooden stake, but people still had to come to accept his offer, like his heavenly Father accepted the ransom offer. Jesus asked us to become one like he is one with the Father. That is not such an easy task, because Jesus managed to do the Will of God and did put his will totally aside to please the Only One God. Naturally in case Jesus is God he always would have done his own will, but here we have a man of flesh and blood who was wiling to put himself totally aside for helping others, for having the best relationship with the Creator. We too should go for that best relationship with the Divine Creator Deity. He is the One Who calls and has given us His only begotten son so we may be cleared of our sins. Like Jesus prayed to his heavenly Father and taught us to pray we too should pray to god and only worship Him. The best way to come to see who is Jesus and who is his heavenly Father and what God has prepared for us, we best read regularly the Bible and study it carefully. By letting the Word of God come into our mind and in our heart, the Spirit of God, God His Force can work in us. True Christians are pilgrims and strangers in a strange land. Not only is our citizenship in heaven, but positionally we are now seated in Christ Jesus in the heavenlies. God is our creator, father, healer, mother, friend, provided, helper, judge,etc… He gave his only son Jesus to die for our sins. God sees us through Jesus and not our sinful nature. Without the sacrifice we would be lost in sin. But God! But God! It’s as if the Creator had no sense of fair play and justice – unbelievable! If it is true, then, were certain souls sent down to earth from the Heavens to suffer poverty, pain and misery on attaining the human form for a predestined period of time? Everyone sins; everyone falls short (Romans 3:23). That’s the bad news. But the good news is that Christ Jesus has built a bridge over the gap that was created by sin. God is holy and He can’t stand sin—sin is anything against God. So as we sin, we are moving ourselves away from God. The blood of Christ was poured out for each one of us to have a way to be righteous (right with God). Only if we believe in Him are we saved from the sin punishment. Even so, we must continue to repent for our sins and recognize our constant need for Jesus Christ. The Essenes left Jerusalem to rid themselves of the pagan influences of the Greeks and the Romans, after founding a community of like minded essene worshippers, at the Dead Sea. These teaching were apparently an extension of the 2 greatest commandments about love and the rest of the 10 commandments. Some of the sayings in here we have heard or read many times before and were the foundation for our legal system. rayer is more than words and time. Prayer is action! Prayer involves faith and faith without works is dead( scripture).Prayer is the most attacked by the kingdom of darkness. Prayer tears downs strongholds and invisible kingdoms. If a believer has no prayer life it’s like saying they have no oxygen and connection to their lifeline. The Lord is faithful to His word and to every promise. This is why it is so important for us to be in the word every day reading it and meditating upon it. God’s word is filled with promises and testimonies of individuals who trusted in the Lord with all their heart and that He was faithful every time. His word is the food and sustenance of our spiritual lives. We must feed on it daily.